It’s true — Seattle has sprung into the era of algorithm romance! Although not everyone is on Tinder for a long-term relationship, many are joining in an inspiring conquest to find true love. Worried that you’ll spend the rest of your days swiping left? We got it. 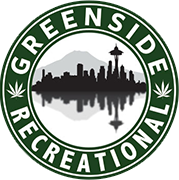 Meeting new people can be scary, and Greenside Recreational has your back! Because with the right cannabis product and a lot of deep breathing, you’ll be one step further on the pursuit of romantic bliss. Depending on who exactly you swiped right on, Greenside has some recommendations on cannabis products to help you navigate the real-world ramifications of online dating. Maybe you aren’t looking for love, so much as you are hoping for a thrilling night on the town or in someone’s loft! So start the evening off right with Drift™ Spray by Mirth Provisions. Each canister contains ten doses of THC — pot’s psychoactive component — and is infused with organic peppermint oil. This fantastic sublingual promotes a subtle, bubbling euphoria and provides a minty kick for fresh breath. The only difficult thing about this date will be containing the THC-influenced giggles. By all means, let them loose, just keep in mind that timing is everything. Send the right message by offering a first date token! If the potential mate in question has “coffee lover” in their bio, aim for something they can pair with their beloved cup of joe on a weekend morning. And since nothing goes better together than coffee and chocolate, Honu has a great line of low-dose cannabis infused bites perfect for someone new to the world of weed. Plenty of Greenside’s customers love Honu’s Chocolate Turtles and Snowballs, so we reckon they’ll be a low-risk choice for getting to know someone. Whether their vice is biking, hiking or just taking #gymlife selfies in the weight room, you might have swiped right on someone who doesn’t stop moving. That said, chances are you won’t be headed to The Cheesecake Factory or Regal Cinemas, and the date will most likely leave you with sweaty clothes, mild bruising and heavy breathing — and not in the way that’d be normally desirable. Ethos Innovates has formulated the Muscle Melt Rub, which is now the best selling cannabis topical in Washington State and is perfect after long workout. Just remember that it’s for working out kinks rather than contributing to one. Bump some Destiny’s Child, hit the Northgate Mall for a hot date night outfit and drive only five minutes further to browse your pre-date pot selection at Greenside. Fortunately, marijuana is a relaxant and can help calm those nervous butterflies. Sativa hybrids like Agent Orange by Noble Farms are sweet, uplifting and will slap a smile on your face faster than you’d think. It’s time to hop back on that horse, honey! We know you’re out there. You’re swiping right on everybody in the building, and it’s not for a loving affair, or some late night hanky-panky. Going out to eat is expensive nowadays and some nights, you just want a warm meal in exchange for hearing about someone’s five cats. In this case, we suggest returning the favor with a quick smoke session for dessert. Try a premium pre-roll like a Sitka Kief and Leaf, because sharing is caring and eating on someone else’s dime just because you can is well, not. Think you were a victim of one of these? Hit up Jubal and get yourself some answers on the Second Date Update.